Across the UK, clinical academic careers are a key area in the development of forward-looking health services that support highly skilled practitioners to engage with academic research that could also drive forward improvements in the organisation and delivery of health care, in an increasingly complex environment. The clinical academic pathway provides the option of two distinct routes for multidisciplinary clinicians, respectively the Clinical Improvement Programme (CIP), the Clinical Academic Programme (CAP) and the Clinical Research Practitioner Programme (CRP). These programmes lead to a postgraduate research academic award as well as ‘added-value’ skills and knowledge by access to mentoring and a wide range of optional modules aligned with their career trajectory, including a teaching qualification. These provide the framework for clinicians to engage in academic work as part of their clinical career, providing an enriched trajectory that includes engagement with a combination of clinical, research, improvement and teaching work. It also provides an integrated pathway to progression for multidisciplinary clinicians within the University and the clinical environment. 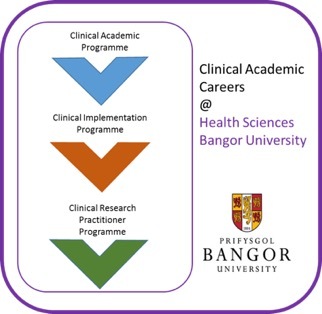 The Clinical Academic Pathway is embedded with the research centres in the School of Health Sciences, representing a expertise: Ageing and Dementia @Bangor including the Dementia Services Development Centre (DSDC), Implement@BU, the North Wales Organisation for Randomised Trials in Health (NWORTH), the Centre for Health Economics and Medicines Evaluation (CHEME) and the Noth Wales Centre for Primary Care Research (NWCPCR). The Clinical Academic Pathway provides a scaffolding for innovation in practice and enables clinicians to continue within practice, whilst completing a postgraduate research degree (PGR) and bridge university with clinical life. Importantly as part of this initiative, a ‘Community of Scholars in Practice’ provides peer support for Clinical Academics, facilitating shared learning and enterprise.